Are you tired of having to rush miles from your camping site just so you can use the bathroom? Could you use a portable toilet for your small boat when you’re out on the lake fishing? These portable toilet reviews will help you select the perfect option for your boat, RV, or that little corner of your workshop so you don’t have to wait when it’s time to go. The best portable toilet isn’t always easy to find. You need quality information to make an empowered choice, which is exactly what you’ll receive from the helpful chart below. 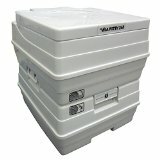 The best portable toilet is going to provide you with an easy way to go when you don’t have any other options. Rather than just use a hole in the ground, this technology will replicate a toileting experience so that you can manage your waste in a more efficient way. 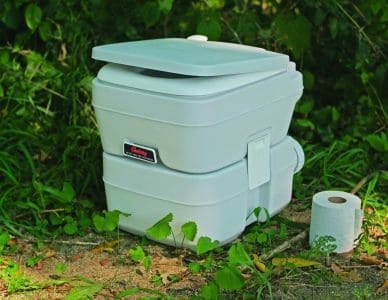 Whether it is for camping out in the backwoods or a toilet for your mini-camper, you’ll be able to find the best design at the best price thanks to these portable toilet reviews. 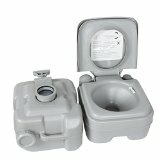 Most of the models that we’ve covered are chemical toilets, however there are some other types of toilets in our reviews as well, to provide a broad cross section of the different types of portable toilets that are on the market. Are There Benefits To Owning a Portable Toilet? For your basic portable toilet, the primary benefit is that you’re going to give yourself an easy way to use the bathroom when there isn’t a toilet to be found. It can be as simple as a lid on a 5 gallon bucket, but at least it is something that will provide you with the toileting options you need. More advanced toilets can replicate a traditional experience and even include fresh water flushing thanks to dual storage bins. These toilets are also lightweight, which means you can pack them in virtually anywhere. Some models even allow for a measure of privacy thanks to included tents or screens that can be put up around the toileting area. You’ll also be able to pack out all of your waste with the modern portable toilet, which means you’re going to be helping the environment as well. It’s also a lot easier to manage your waste. Many of the best portable toilets have a spigot that is either installed or incorporated into the design of the toilet. With additives that break down the waste into a liquid placed in the black water basin, all you’ve got to do is release the valve and the waste will stream out of the toilet. What Kind of Problems Do Portable Toilets Have? In a nutshell, odor is a problem. Although there are some good portable toilets that have dual basins and strong seals, many portable toilets are designed as a temporary storage measure for your waste. That means once you open up that lid, you’re going to be bombarded by a cacophony of smells that you’d likely rather forget! You can manage some of the odor issues with regular maintenance and cleaning. There’s also a question of comfort, as some portable toilets are very generic and require the use of plastic liners or bags for proper hygienic disposal. That can sometimes be a difficult transition, especially if someone has never used a portable toilet before. Finally, you should make sure that you follow all of the safety precautions provided by the manufacturer when cleaning your portable toilet, for the health and safety of all users of your toilet. How Do You Find the Best Portable Toilet? Your journey toward a brand new portable toilet begins with our comprehensive reviews. Our portable toilet reviews will give you a good, realistic glimpse of what it really means to own that particular toilet. We cover the good, the bad, and the ugly sides of each toilet in a fact-based manner so that you have the information needed to make a wise decision. You’ll also want to consider what kind of portable toilet makes you the most comfortable. Some people don’t mind using a bucket with a toilet seat as a lid. Others don’t mind using a portable toilet, but they’d rather use a plastic bag or liner to make waste disposal an easier proposition. There are some folks who want more of a traditional toileting experience, so a double basin portable toilet is a better option. Finding the features that you like is critical to the selection process! There’s also the quality of the materials used in the craftsmanship of each toilet to consider as well. Some portable toilets use a basic-grade plastic that is similar to what you’d find on your average container. There are others which use a high-grade plastic that is much more durable. If you plan on using your portable toilet regularly, then the high-grade construction is definitely the investment you’ll want to make. How Do You Care For a Portable Toilet? For most portable toilets, your regular maintenance is taken care of by a plastic liner. Most liners are about $2 a piece and can be found on Amazon and at your major sporting goods retailers. You’ll want to make sure you regularly change the liner to prevent odors from building up. Although high-grade plastic is fairly resistant to odor, it is still a porous material and can absorb odors over time. In order to control odors in-between liner changes, you’ll want to consider placing an odor-absorbing substance in the bottom of your portable toilet. The most cost-effective substance to use that you can pick up virtually anywhere is kitty litter. Cove the bottom of the liner with kitty litter after placing it into the toilet basin and it will work to eliminate the bothersome odors. Add more if necessary after a particularly poignant delivery! What Are the Prices For the Best Portable Toilets? You can grab a portable toilet on Amazon right now for less than $20. It’s not anything fancy, just your basic 5 gallon bucket with a toilet seat lid, but throw in a plastic liner and you’ve got a viable toilet. If you’re looking for something a little more modern than that option, top portable toilets can be more than $200 sometimes. For the most part, however, you’ll be able to get one of the best portable toilets for right around $125. Although the marketing efforts for this product are calling it a portable toilet, let’s just be honest and call it like it is. It’s a loo bucket. The design is simple because you’re basically snapping a lid on top of a 5 gallon bucket that has a lid you can close on it to prevent odors from escaping if you don’t have the chance to dump the bucket out right away. If you like to go fishing, it’s a good thing to take with you out on the boat, especially small boats that don’t have a hunt. Are you looking for a design that will give you some measure of comfort, but also provide you with a hygienic experience! With the Hassock portable toilet from Reliance Products, you’ve got a lot of potential to have your needs met. 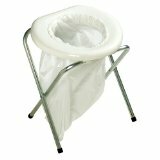 This is a very portable, lightweight toilet that offers an inner splashguard so that you won’t have to worry about something kicking back on you. It really is a good, economical experience. If you’re tired of using dirty public bathrooms when you’re out on a camping trip that are poorly maintained or you want something in your vehicle that can give you an emergency pit stop when a rest area isn’t close, then this is definitely the portable toilet for you! We really love how this toilet sits at a regular height. Unlike other portable toilets, you won’t find a compromise in quality to achieve the added height either, which is a definite improvement. 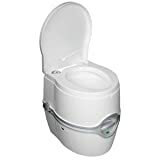 It’s stable on a firm surface when the water tanks are filled and it uses just a small amount of water, so you’ll get about 50 flushes from the toilet before you need to change it out. It’s sturdy, solid, and can support large individuals with ease. If there was one place where we’d like to see an improvement in this toilet’s design, it would be with the lid. It’s not the firmest lid in the world and is not something that you’ll want to use as a chair if you need a quiet moment somewhere and this is your only seating option. With the Camco portable toilet, you’re going to be getting 5.3 gallons of storage space that will hold a surprisingly large amount of waste! Although there aren’t separate tanks that can be accessed in this particular model, you do get a design that will unlock the waste tank from the toilet for easy disposal. We really enjoyed the fact that there is a sealing slide valve lock incorporated on the design of this particular toilet. That’s the secret to this toilet’s success! You simply slide the latch off to remove the tank and then slide it back on to seal it up once again. Going portable shouldn’t mean sacrificing cleanliness. With the best portable toilet, you won’t have to sacrifice anything when you need to go in a hurry! Go through our comprehensive portable toilet reviews today and you’ll be certain to find the perfect portable option for you!